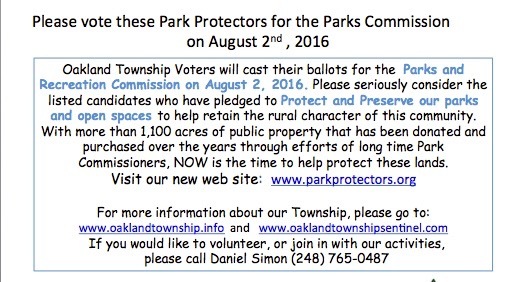 Good news and bad news for Oakland Township? 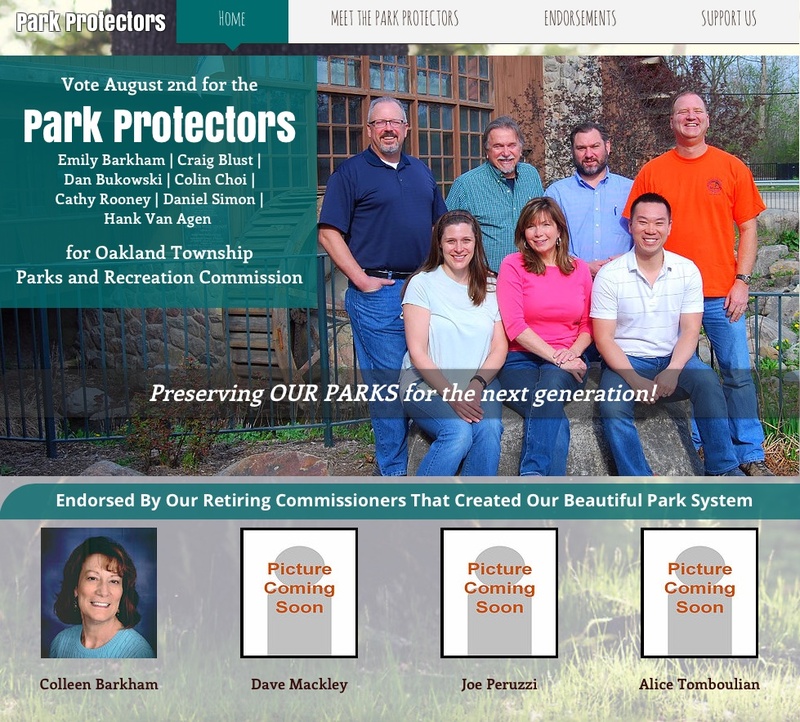 THE GOOD NEWS – At the January 13, 2015 Oakland Township Board meeting a positive step was taken in improving the relationship between the Township Board and the Parks and Recreation Commission (PRC). There was an agreement made regarding the employment status and unionization efforts of PRC employees. THE BAD NEWS – Contrary to what Supervisor Gonser stated, Trustee Bailey confirmed that unionization efforts by the Parks Commission employees occurred after the current Board was elected. Unionization efforts are typically initiated by employees to protect themselves from administrative’ actions and decisions. 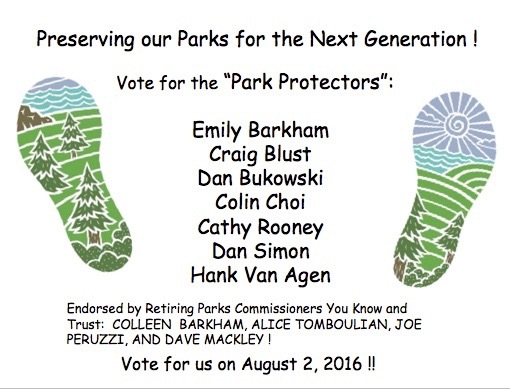 The Parks Commission employees are considering joining a union. The Fire Fighters joined a union after the current Board came into office. At the January 13, 2015 Oakland Township Board meeting, the Township Board agreed to a Tentative Settlement Agreement between the Oakland Township Board, the Oakland Township Parks and Recreation Commission and the Michigan AFSCME Council 25, AFL-CIO. 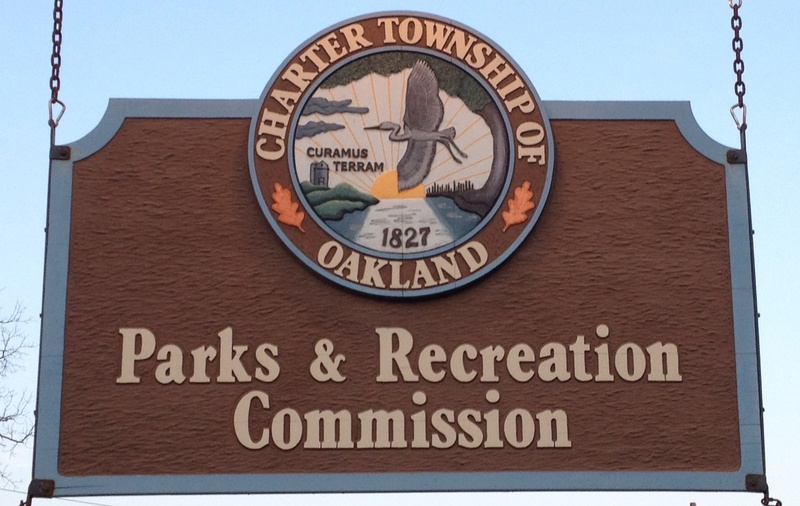 This agreement states that the Township Parks and Recreation Commission employees are co-employed by the Parks and Recreation Commission as well as the Township. It states that both parties (PRC and Township) ‘have the right to participate in bargaining with the proposed bargaining unit’. This tentative agreement was negotiated as a result of a December 16, 2014 State of Michigan Employment Relations Commission Hearing. This Tenatative agreement was approved by the Parks and Recreation Commission at their December 17, 2014 meeting after the hearing. The issue of who the Parks and Recreation employees ‘work for’ has been a contentious issue ever since the current Board of Trustees came into office in 2012. Several members of the Board had taken the position that the PRC employees were under their control, not the Parks and Recreation Commission. The issue had escalated to the point where legal action had been taken between the Board and the PRC. Taxpayer money has been spent on arriving at the Tentative Agreement. At the January 13th Board meeting, Supervisor Gonser stated that the unionization efforts by Township Staff was started under the former Board (the Fire Department is now unionized and the PRC employees are considering joining a union). Trustee Michael Bailey corrected Supervisor Gonser indicating that the unionization efforts were started after this Board was elected. “I do not recall any discussion about unionization of Parks Commission during our tenure on previous Board. Here is a copy of the agreement. Why is this important to the citizens of Oakland Township? The approval of the agreement can be construed as a ‘bury the hatchet’ action by both the Township Board and the PRC. Hopefully future actions the Board takes will keep the positive direction taken in this first step. The only reason we were dealing with this issue is because of the attacks that Supervisor Gonser, and several other members of the Board, have taken against the Parks and Recreation Commission and employees. Employees seek union protection when they fear actions that their ‘management’ may take. The potential unionization of Township employees does not benefit the Township or ultimately the employees if a good working relationship with ‘administration’ can be maintained. Supervisor Gonser’s denial that unionization efforts started when this Board was elected in 2012 is another example of him trying to distance himself from the consequences of his actions. Hopefully the majority of the Board will continue to improve the relationship with the PRC and eliminate any further legal expense associated with asking the court system to resolve issues. This entry was posted in Board vs. Parks, Legal Problems, Supervisor Gonser and tagged Gonser, Mike Bailey, oakland township, Oakland Township Board, Oakland Township Parks, Parks Commission, Supervisor Gonser, Supervisor Terry Gonser, Terry Gonser on January 22, 2015 by richardjmichalski. Supervisor Gonser knew about a proposed gas pipeline through Oakand Township more than a month before the Parks and Recreation Commission was informed that the pipeline was proposed to go through one of our Parks. Gonser chose not to inform the Parks Commission about this project. He later approved the survey work on the park land even though he knew the Parks Commission had not approved the request. 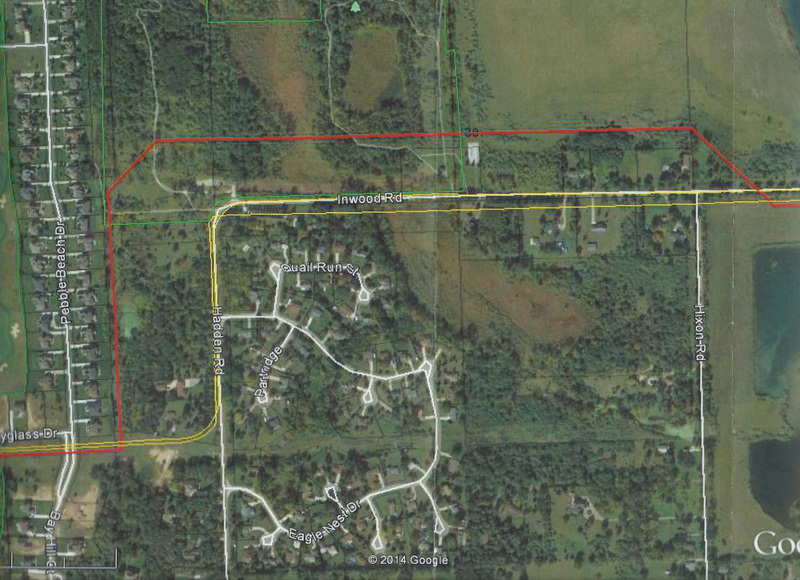 As reported previously on this website, Vector Pipeline, a representative of DTE, met with the Oakland Township Parks and Recreation Commission on November 12, 2014 to request approval from the Parks Commission to proceed with a survey through Draper Twin Lakes Park to potentially install a 42 inch diameter gas line. This proposed path is an optional path Vector Pipeline wanted to consider rather than using an existing right of way adjacent to the Park property. There was no good reason given for why Vector Pipeline preferred to use the parkland. This line would traverse our entire Township. The Parks Commission did not grant approval to proceed with the survey work. However, a few days after the meeting, a survey company was seen surveying the parkland. Upon investigation, it was discovered that Supervisor Gonser had given approval to survey the land without the Parks Commission’s knowledge or approval. 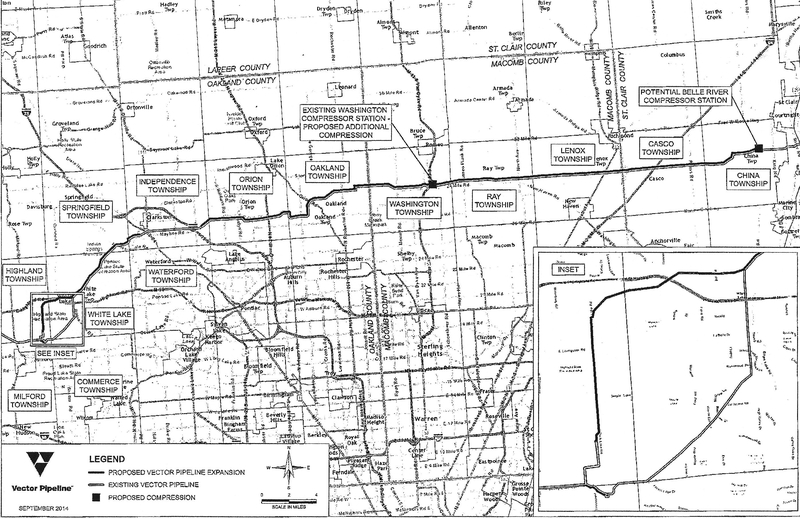 Information obtained through the Freedom of Information Act (FOIA) indicates that Supervisor Gonser met with DTE, knew about the proposal, had a map of the proposed path, and sent a letter to the Board members informing them of project more than a month (October 2 and 3) before the Parks Commission meeting. Supervisor Gonser apparently did not feel it necessary to inform the Parks Commission since they were not included on his email. Gonser’s letter also included a draft letter that Vector Pipeline planned to send to all affected landowners prior to doing any surveying. The Parks Commission never received a copy of the letter. Gonser must have felt that since he had seen the letter, he felt it acceptable to approve the survey request even though he knew the Parks Commission had not approved it. A discussion of Gonser’s actions on this issue is on the agenda for the January 13 BOT meeting. Please come to the meeting or watch the discussion on your computer or TV. Why is this important to the citizens of Oakland Township? The Township Board, and particularly Supervisor Gonser, has had a number of confrontations with the Parks and Recreation Commission. Some of these confrontations have escalated to formal legal proceedings. Gonser’s obvious “in your face” decision to approve the survey work without having shared his prior knowledge of the project is yet another one of his ‘attacks’ on the Parks Commission. He approved the request without having valid reasons given for why the existing right of ways could not be used. His underhanded withholding of information from the Parks Commission is yet another example of his leadership style and ethics. He claims to spend 50 to 60 hours per week on Township work, yet he could not take 30 seconds and include the Parks Commission on distribution on his October 3, 2014 email? This entry was posted in A new kind of "Transparency", Board of Trustees, Board vs. Parks, Ethics, Supervisor Gonser and tagged Abuse of Power, Board of Trustees, Dictatorship, Gonser, oakland township, Oakland Township Board, Oakland Township Ethics, Oakland Township Parks, Parks and Recreation, Parks Commission, Supervisor Gonser, Supervisor Terry Gonser, Terry Gonser, Unprofessional behavior on January 10, 2015 by richardjmichalski.